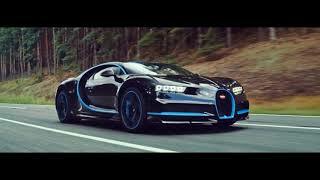 The 2010 release, Veyron Super Sport still holds the Guinness World Record for fastest super car. However at the 2016 Geneva Motor Show, Bugatti presented its all new Bugatti Chiron 2017, which to us looked like the new record maker. You don’t believe us? 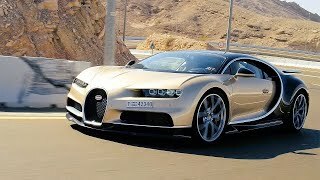 Let us have a look at the review of Bugatti Chiron 2017 to know the specifications and performance figures in detail. The interior of Bugatti Chiron 2017 is all drenched in carbon fiber, aluminum or fine leather, making it an impeccable blend of sportiness and luxury. The clean and simple cabin doesn’t compromises with the modern era touch. There is a wide center stack housed with four horizontally aligned buttons featuring tiny displays on each of the. Behind the three-spoke flat bottom sporty steering wheel we have a newly designed instrument cluster. The integration comprises two smaller gauges and a display on the right side portraying the navigation map. The interior isn’t just about these but it also comes with a state-of-the-art sound system and the gorgeous enamel and solid silver made ‘Bugatti’ emblem. Thus rounding up the interior details of Bugatti Chiron 2017 I’ll call it highly luxurious, sportive and drenched in technology that takes it a lap ahead of the rest in market. The exterior of Bugatti Chiron 2017 keeps the traditional looks with a blend to attract new buyers. The legendary grille sits proudly amidst the LED headlamps which further get connected and create air intakes that will be sending fresh air to the brakes. The angular V Shaped hood gets more aggressive while the lower air intakes get slim to contribute to the aerodynamic performance. Moving towards the side, we have the C shaped curve, defining the rear portion of the sides. Getting to the rear fascia you’ll again notice the aerodynamic engineering, like the three-piece intake that has a massive diffuser. There is also a big center mounted outlet, giving the model much needed race spec looks. 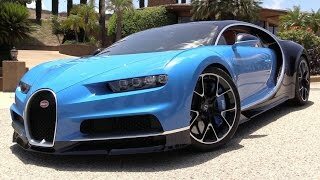 Thus rounding up the entire exterior details of Bugatti Chiron 2017 I’ll call the dual tone finishing and the aerodynamic features adding to looks a remarkable work of engineering and design. Powering the Bugatti Chiron 2017 is a powerful 8.0 liter W-16 engine cranking total output of 1479 hp peak torque of 1600 nm. 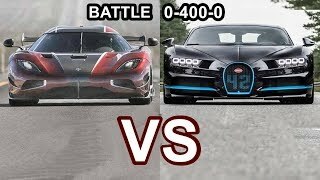 With this power the top speed of Bugatti Chiron 2017 touches the mark of 260 mph while the 0-62 mph sprint can be knocked in just 2.5 seconds. Further the model can sprint to 124 mph in less than 6.5 seconds and to 186 mph below 13.6 seconds.